Celebrations have taken place for the opening of Joe the Quilter's cottage at Beamish, The Living Museum of the North. 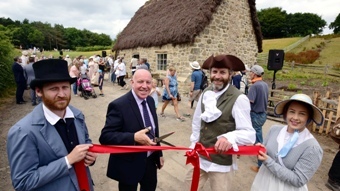 The cottage - the first building in the museum's £18million Remaking Beamish project - is a recreation of the "lost" home of renowned Georgian quilter Joseph Hedley, who was murdered in 1826, in an appalling crime that shocked the nation. The cottage features stones from Joe's original home, after the remains of the building in Warden, near Hexham, Northumberland, were uncovered during an archaeological dig by Beamish staff and community members. These will include the flagstones where Joe stood 200 years ago. The exhibit, which tells the story of quilting and the growth of cottage industries in the early 1800s, has been painstakingly recreated by skilled museum staff. A drawing on a postcard that was produced after Joe's murder gave valuable details about how his home - which was later demolished in 1872 - looked. A crack in the front wall of the original cottage, clearly visible in the 1820s drawing, has even been reproduced. The Remaking Beamish project is the biggest development in the museum's 48-year history and also includes a 1950s Town, 1950s Farm and Georgian coaching inn, where visitors can stay overnight. Richard Evans, Beamish's Director, said: "This is a really exciting moment for us all at Beamish. After years of planning we have finally opened the first of many new exhibits that are part of Remaking Beamish, a major £18million development that is currently underway at the museum. "This beautifully-crafted, heather-thatched cottage gives us a rare chance to understand what everyday life was like in the North East during the early part of the 19th century. "The quality of this latest addition to Beamish is outstanding - the result of many years of research, painstaking craftsmanship and the involvement of local community groups and schools. It is a real credit to the dedication and talent of our staff and volunteers, who have created this fascinating new experience for our visitors." Joe's cottage has been built with traditional techniques and skills, using local materials. Around 1,400 bales of heather were sourced sustainably from near Rothbury, Northumberland, and a master thatcher taught his craft to museum staff and volunteers. Stone dating back over 200 years, and 23 tonnes of oak for the roof frame, also came from Northumberland, near where the cottage once stood. One of Beamish's blacksmiths made objects using traditional methods, including door locks, hinges and candlesticks, and the door and windows were also made by the museum team. Volunteers created a replica of Joe's quilt from Beamish's collection, which took nearly 800 hours to complete. Groups can be a part of history and explore Joe the Quilter's cottage during a visit to Beamish Museum. Beamish is the perfect place for group visits to North East England, with something for visitors of all ages and interests as they take a tram ride back in time and experience the sights, sounds, smells and delicious tastes of 1820s Pockerley, The 1900s Town, The 1900s Pit Village and The 1940s Farm (admission charge applies). Enjoy a true taste of Beamish with Dainty Bites, a light buffet lunch to include sandwiches, crisps, cake, and tea/coffee, served in a private room overlooking the award-winning Town (subject to availability and excluding school and Bank Holidays - Dainty Bites must be booked in advance). For more information about group visits to Beamish or the Remaking Beamish project, visit http://www.beamish.org.uk.